Recent statistics have shown that most of South African citizens are not people who save money and most of the times don’t have a financial plan in place for the future. 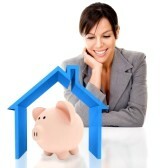 In this article I will explain the importance of saving for a home loan. South Africa’s current household savings rate is 16%, relatively lower than when compared to other countries in the world. Professionals in the real estate trade have told that people who want to buy a home in the future that without having a saving plan in place that they should definitely consider changing their spending patterns and start saving money as soon as possible. It is a concerning fact to see that South Africans are not able to enter the real estate markets, although it is prime time to invest, due to the fact that they have not made pre-financial planning. Nowadays it is very important to know that your credit status is directly linked to your home. We have seen that before the National Credit Act of South Africa has come to terms; it was a lot easier for consumers to obtain credit with low, or even no deposits at all. This meant that South Africans were able to buy homes and other items on credit with no hassles at all, but caused a lot of irresponsible spending habits, causing a lot of South African to have a high income to debt ratio. Statistics shows that there is still a lot of South African who are struggling with debt, after the NCA has stepped in; there are thus magnificent improvements in the countries financial statuses. This is because banks are now not so lenient anymore; they have much stricter criteria for people who are applying for credit. It has never been so important to take good care of one’s personal finances. This has caused South Africans to be more responsible with their money. People are spending wiser than before, because they know that they need good credit in order to obtain that home loan. South Africans should know that they should be able to show the lenders that they will be able to afford the bond and most of the lenders would like to have a deposit on loan before approving any credit. There are thus numerous ways to save money and to reduce debt. Next I will give a few tips on how to do so. 1. By making use of a professional financial advisor can help you to make a personal money plan. 2. It would be wise to make a budget list and strictly sticking to it. 3. It is also essential to have a savings plan listed in the budget. 4. Cut down on unnecessary luxurious spending habits. 5. Before you buy anything, first compare it to other makes and brands, to see if you are able to save some money on the products. 6. Try not to make so many purchases on credit, rather make a plan to pay in cash. 7. Make sure that you review all of your medical and insurance policies to make sure that you are not paying too much. 8. I would also suggest that you try to cut down on electricity and water usage. It might be small amounts which you save, but it will all add up one day. It is thus clear that by saving money on house hold items and spending will make a big difference in your affordability level which you can then prove to the banks and obtain that much needed deposit and home loan.